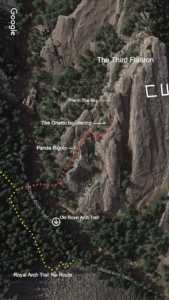 Route Description: Proposed route, Panda Rigolo (5.10d, 25 meters), is an entirely independent line on the south face of an unnamed formation along the eastern south ridge of the Third Flatiron (The Third has two ridges extending south). This small tower is just north of, and connected to, W.C. Fields Pinnacle. There are three established climbs on the west side of this tower and one route, Two Bolt Mystery Route, on its south face. Panda Rigolo ascends large holds on good quality rock along the left edge of the south face, angling left at first, then straight up, then right to an anchor which would be situated directly above Two Bolt Mystery Route. The climbing is mostly 5.9 or easy 5.10, with a brief crux near the top. A description of existing routes on the same face of the rock formation, including the number of routes, route names, route grade, type [traditional or bolted], and approximate distance between routes (a photocopy or diagram of the existing route(s) is also required): There are three routes on the west side of the unnamed tower: Soarks 5.10a R, Holier Than Thou 5.11c, and Funny Games 5.12d R. Directly up the center of the south face is Two Bolt Mystery Route 5.11b. Two Bolt Mystery Route is suspected to have been an abandoned line from the late 1980s, as it is so inadequately bolted as to feel incomplete. The route was never reported, and has been dubbed “Two Bolt Mystery Route” by the climbing community. 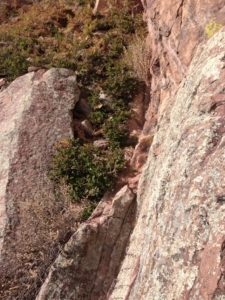 The line has two uninviting, widely spaced bolts; the higher bolt too far below the top to protect a climber from a potentially fatal ground-fall. Due to a section of lesser quality rock on the final portion of Mystery Route climbers usually avoid it. I removed a “bail biner” from the higher bolt while climbing on top-rope, and found no adequate gear placements above the second bolt. It may be that Mystery Route was never climbed on lead. A description of the approach (include approximate distance from the designated trail system, existing “social” or undesignated trails leading to the climb and condition of the trail, and state whether there is a durable surface, such as rock. Include photographs of the approach. 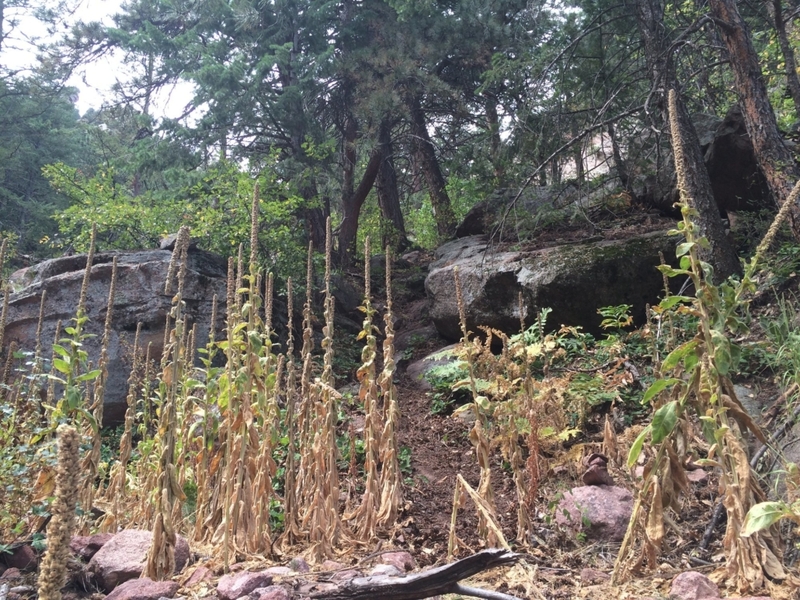 ): The approach is up the Third Flatiron’s southern descent trail. 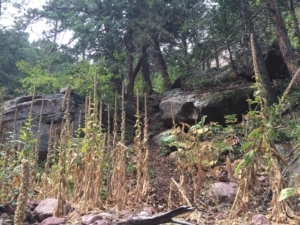 From the Royal Arch Trail make a short descent on a social trail to a creek bed, then ascend the gully on the west side of W.C. Fields Pinnacle for 100m. The south face of unnamed tower is directly above as one passes west of W.C. Fields. The two lonely bolts of Two Bolt Mystery Route can be spotted in the center of the lower half of the face. If different from the approach, a description of the descent, (include approximate distance from the designated trail system, existing “social” or undesignated trails, a description of the trail condition and whether there is a durable surface, such as rock. Include photographs of the descent. ): Descend the approach, on the Third Flatiron’s southern descent trail. A description of the area at the base of the climb (include existing levels of soil compaction, existence of a durable surface such as rock, and existing soil erosion. Include photographs of the area at the base of the climb. ): Compact dirt and bare rock on the southern descent trail of the Third Flatiron. The trail touches the base of the wall where the staging area is. Has all reconnaissance work that can be reasonably done, short of placing any hardware, been done? 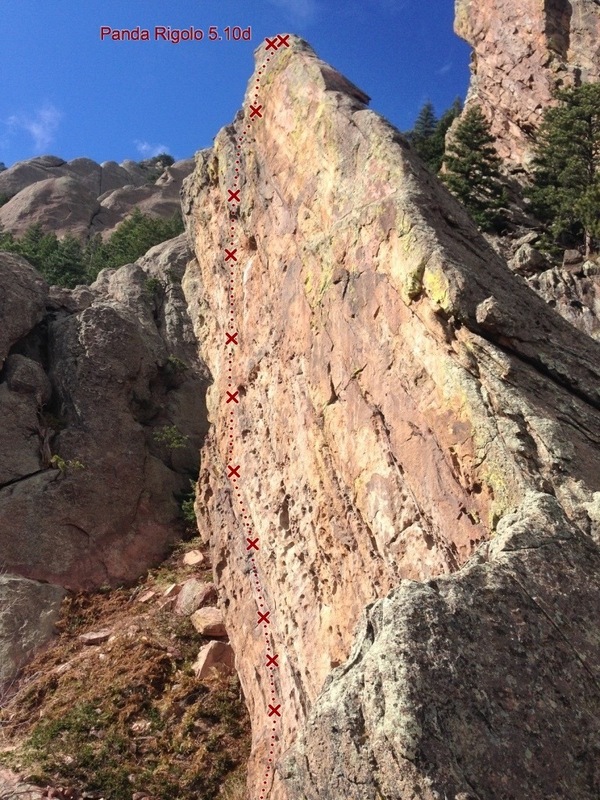 Exact line of the climb is well established after numerous top-rope ascents. Bolt locations have been worked out. Has the route been top roped? Is there loose rock? Is it extremely overhanging? Route has been top-roped. The climbing is primarily vertical; nothing overhanging. Additional notes: If there were not a two route cap for this sector of The Third I would also apply for Two Bolt Mystery Route to be properly equipped, as its two stray bolts invite unsuspecting climbers onto dangerous unprotected terrain. I chose Panda Rigolo instead because it is a more enjoyable climb on better rock. 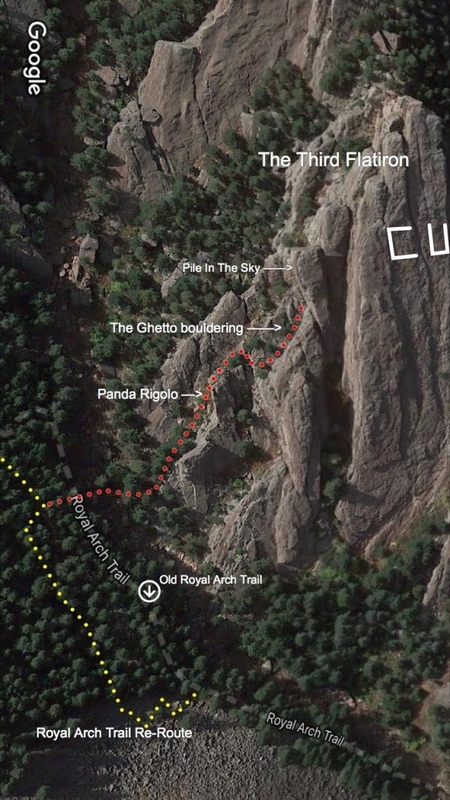 My concern is that people will see the Panda Rigolo anchor far above the two bolts on Mystery Route and go for it. It might be best to remove these bolts and leave it as a clean top-rope for now (bolts are old and require replacing anyway). If the two route cap is ever lifted someone might apply to reestablish Mystery Route, as it has a lot of fun climbing at a moderate grade. This looks great and is a much-needed safe 5.10/5.11 in this zone. I started up it years ago to try to lead it by stuffing cams in the huecos, but it was total death. It will make a fine, logical sport climb.